Why was part of the moon lighter during the total lunar eclipse? Did you notice that part of the moon was lighter and less red during the total lunar eclipse? For example, this variation was shown clearly in this picture sent to me by Allan Jones. Reddish color for 3/4 of the moon, but lighter on the top left. 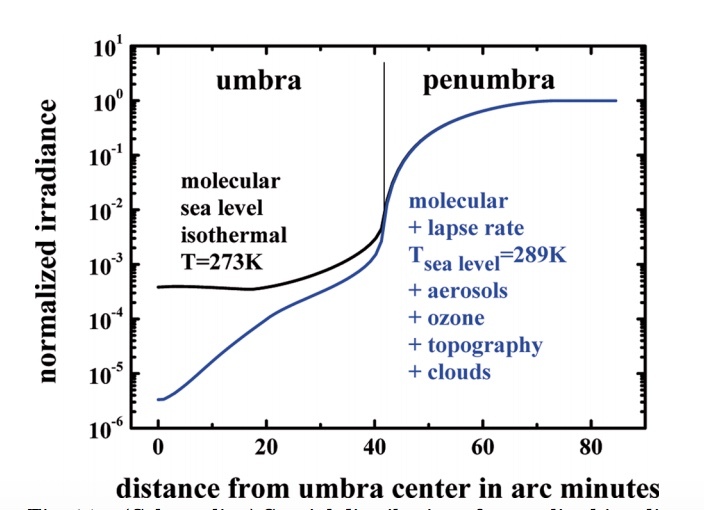 Keep in mind that the moon was totally in the earth's shadow at this point--within the umbra (see figure below). So why the variation of color and lighting while the moon was in the earth's shadow? 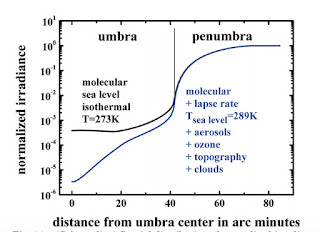 The reason is that light in the umbra is not uniform because of scattering of light by the atmosphere of our planet. If there was no atmosphere or if the atmosphere absorbed all the solar radiation falling on it, the moon would be totally black during such eclipses. 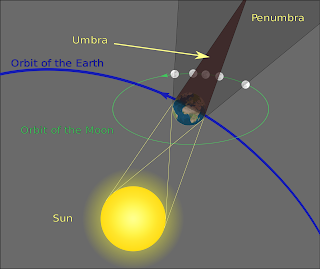 In the real world there is more light in the outer part of the umbra as the atmosphere scatters light around the planet and towards the moon. In fact, there are a number of research papers that simulate this quite realistically, such one by Vollmer and Gedzelman (2008). Here is the relevant plot from that research. The penumbra surrounds the umbra. This simulation shows more light at the edge of the umbra, darkening towards the center. And which part of the moon was nearest the edge of the umbra during the eclipse? You guessed it: the upper left--the lighter part. Which you can see this geometry in a simulation of the eclipse during its height (9:12 PM). The umbra boundary is shown by the inner circle. As noted above, the moon during the total eclipse is illuminated by light being bent around the earth by the atmosphere. 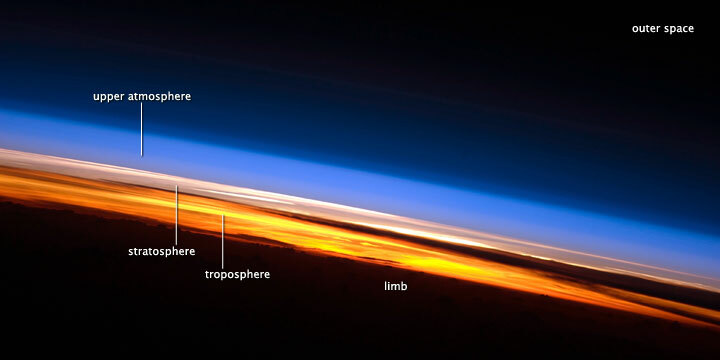 If you ever want a great illustration of this, take a hop to the International Space Station or some orbiting vehicle after the sun has set (see two examples below). 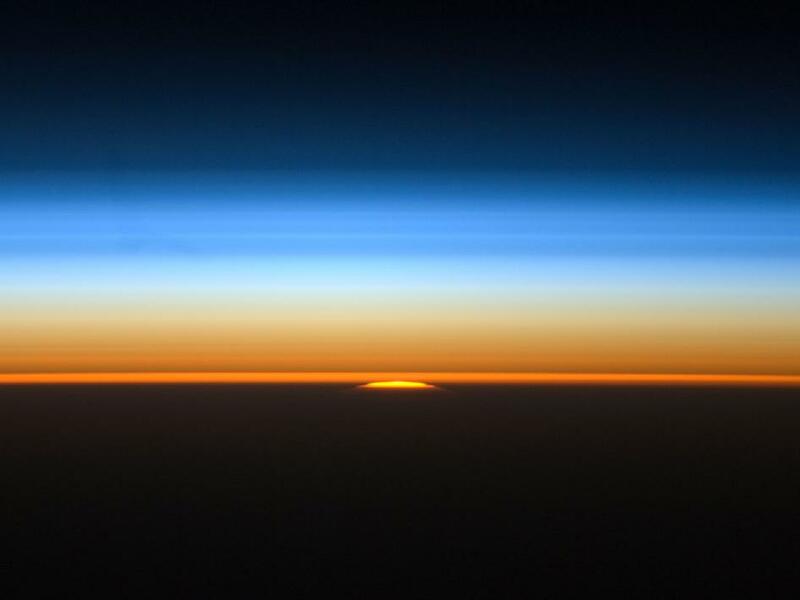 The lower denser atmosphere, which scatters blue/green colors effectively, leaving red and orange, has the bright red/orange hue. In contrast, the thin upper atmosphere has a bluish cast. 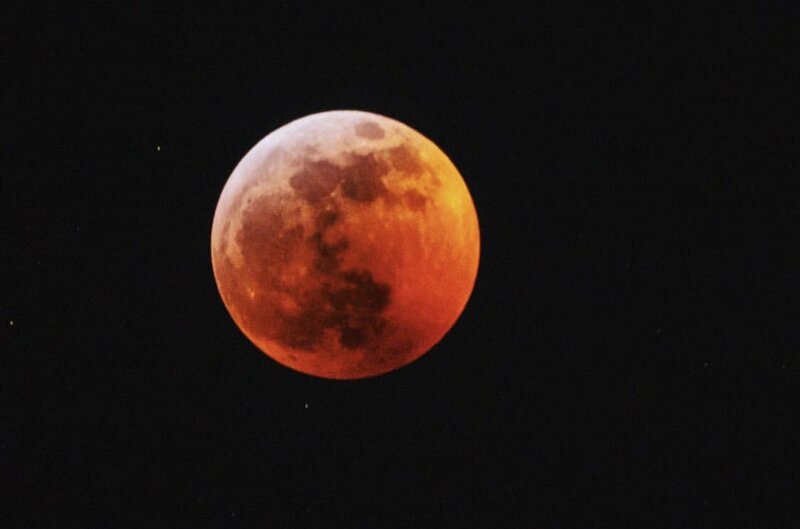 It is the light scattered around the edge of the earth by the atmosphere (dominated by the reds) that was illuminating the moon during the eclipse. The amount of light scattered towards the moon is not always the same. During periods in which the atmosphere is full of particles (such as after a major volcanic explosion), eclipses can be particularly red and dark. 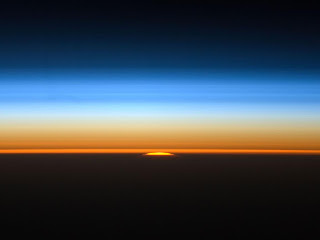 From a more philosophical angle, pictures from space such as the above shows how thin are atmosphere really is, accentuating our need to take care of it. As you can tell, I really enjoy eclipses. 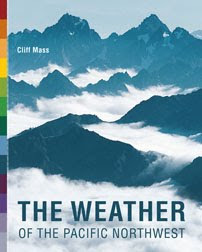 The biggest career decision of my life was whether to go into atmospheric sciences or astronomy, which is why I did my undergraduate work at Cornell, where I could study both (with one of my first papers on a simulation of the Martian atmosphere). I did my undergraduate degree at Cornell so I could study birds and ecology and writing. Hurray for Cornell! Thank you for the explanation. I kept waiting for it to be uniformly reddish, which, as you describe, never happened. Instead there was some brightness in the upper left quadrant. So, if the earth had no atmosphere, I assume we would not see a reddish moon, but would we get a Baily's Beads effect as a result of the earth's irregular topography? Couldnt see a thing when it happened, South of Olympia. It was foggy and cloudy, even blocking out the Moon's glow. I like your philosophical observation stating "From a more philosophical angle, pictures from space such as the above shows how thin are atmosphere really is, accentuating our need to take care of it." After seeing the eclipse event in real time, it reinforces the physical reality of our atmosphere and climate for me (including scientists' future anticipated changes). Love listening to your reports on KNKX. Please help us understand what is happening with the floating disk in the Presumpscot River in Maine. Link to WaPo: https://www.washingtonpost.com/weather/2019/01/23/giant-ice-disk-maine-has-stopped-spinning/. 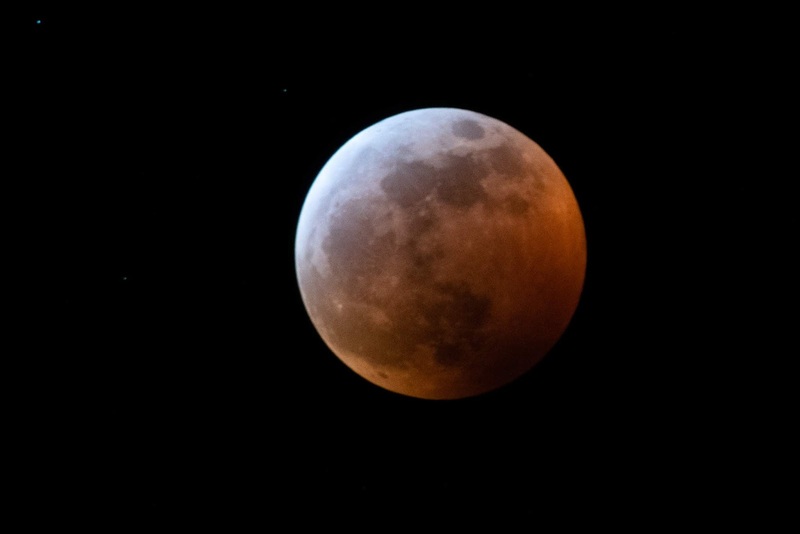 Upon just reading about this, my first knee-jerk non-science-based response was to link it somehow to the lunar eclipse. Set the record straight for us, please? 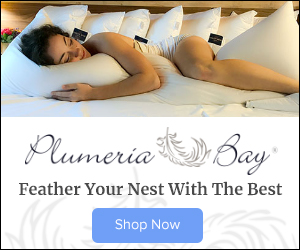 Why is it cold at 2pm and hot overnight? I suspect 5am was the warmest of the last 36hr. Did the regional climate blow a fuse? I like summer eclipses more... Too cold outside! Not only was the sky clear here in Auburn for most of the eclipse, but I actually saw the meteor impact in real time. WOW! Was using a pair of handheld 10x42 Canon image stabilized binoculars. Never expected to see that after watches lunar eclipses for 60 years! Thanks, Cliff - been staring At that for days and now I know. we had great viewing in Port Angeles.